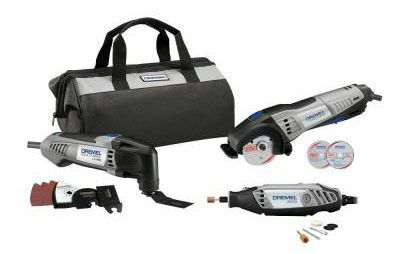 The Dremel CKDR-02 three-tool combo kit includes everything you will need to repair, remodel, restore, cut, sand, and more. Between the Dremel 3000 variable-speed rotary tool, the Multi-Max MM20 oscillating tool, and the Saw-Max cutting tool, you will be able to multitask your way through any project at home or in the shop. Perfect Dremel tool kit for tackling a variety of jobs around the home, workshop, or job site.